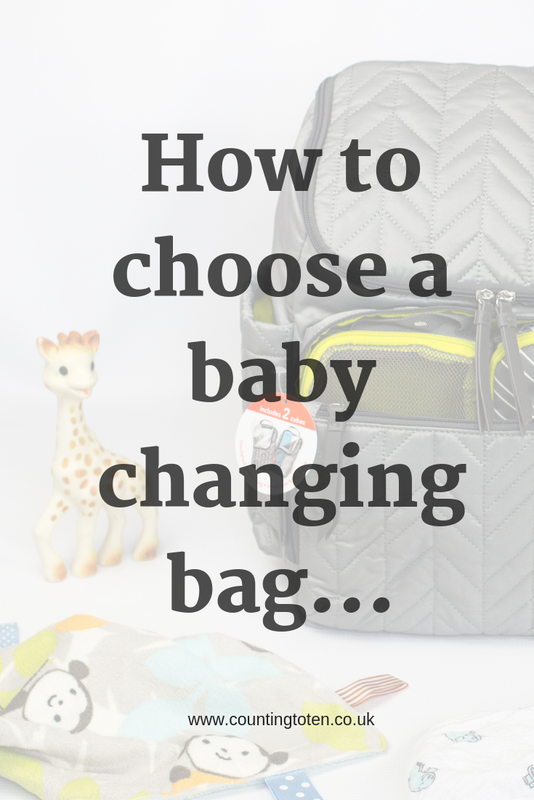 How do you choose a baby changing bag? It’s one of those items you will use every day for a year or more so it needs to be functional, but you also want it to reflect your style and personality if you are swapping it for your favourite handbag. 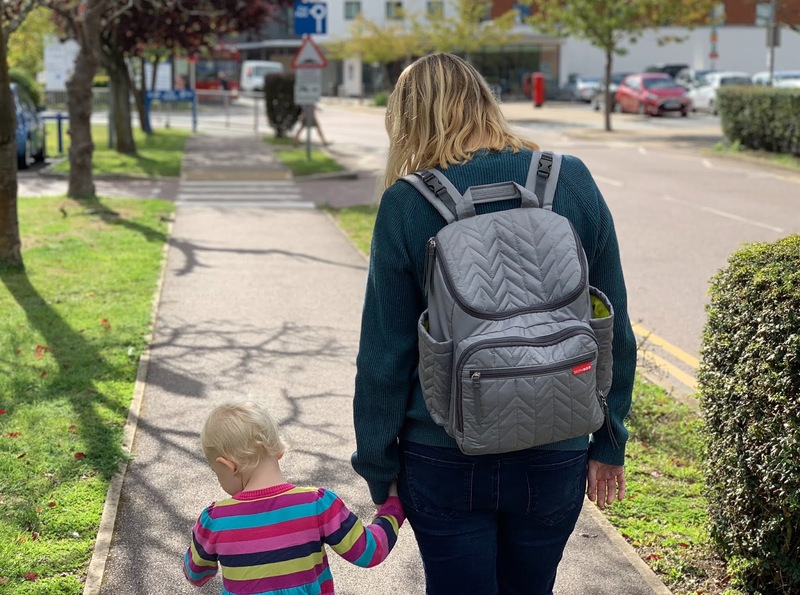 Find out what I think it’s useful to consider and how the Skip Hop Forma Backpack I was sent to review measures up. While you could just throw a few baby essentials in your handbag, a backpack or even a carrier bag I have always preferred to have a designated mid-range changing bag. The cheaper options are often poor quality and don't meet my needs and although the high costs can sometimes be due to the brand it's more often down to the quality, features and functions. How will you carry it? Are you going to be carrying your changing bag a lot or will it mostly be hanging on your pushchair? A combination of babywearing, using a pushchair and my partner just choosing to carry the bag means we want a bag that is a backpack, but can be worn on one shoulder and one that straps to our pushchair too. Specific pushchair clips are handy because it means you can attach it to all styles of pushchairs and buggies in a secure way. How big a bag do you need? 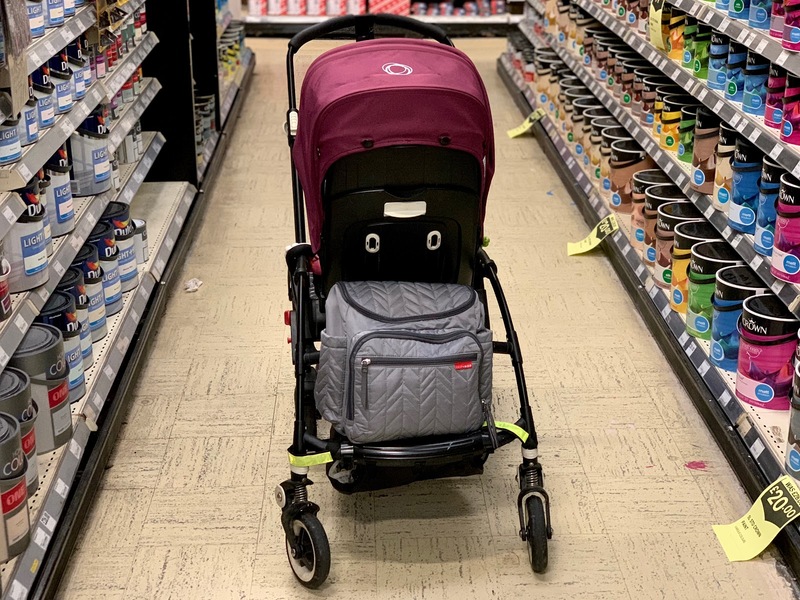 A huge bag may mean you can take everything you might possibly want but it can also be awkward to carry and make it difficult to push your pushchair. One that is too small might mean a choice between a change of clothes for the baby and a jumper for you. The size you need will depend on how many children you have, whether you also have space on the pushchair for bits and if you plan to carry a separate handbag. Our changing bags are often packed full with drinks, snacks, toys, clothes and the obligatory changing kit so I want the bag itself to be as light as possible. Leather bags might last longer, but they will also be heavier so they aren't necessarily a good choice if you have to carry the bag often. Having multiple pockets helps to keep your bag organised and means you can quickly grab what you need, but if there are too many it will make life more complicated. You ideally want a combination of a large main compartment and a few smaller pockets for keys, wallet etc. Zips are quick to undo and stop items falling out. Like most things around children I find changing bags get dirty quickly. At a minimum you need to be able to sponge clean the bag and at best it will be machine washable. Soggy nappies and emergency clothes could be a disaster, but you can’t easily avoid rain so the bag needs to be showerproof at a minimum. If you spend a lot of time outside you might want something more waterproof, especially if your pushchair raincover doesn't cover where the bag will be. Are you interested in the accessories? Changing bags often come with a range of accessories like a bottle holder, changing mats, and pouches. Depending on your parenting approach you might find some of these more or less helpful than others. Do you want the bag to complement the patterns and colours of the pushchair? Will your partner be happy to carry a pink or flowery bag? Most bags come in different colours to help you bring some of your style in to your selection. 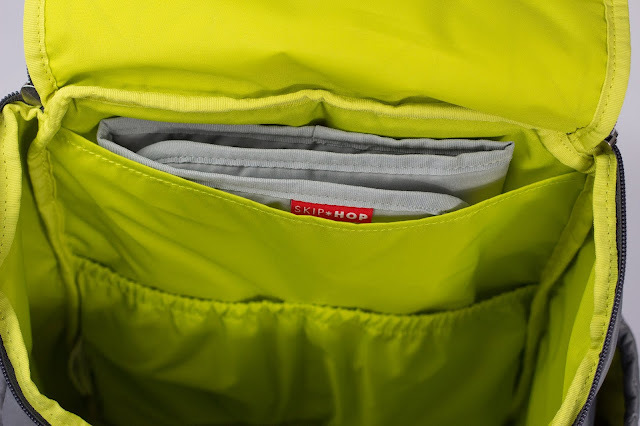 I was sent the Skip Hop Forma Backpack Changing Bag in Grey with a neon inside to review. 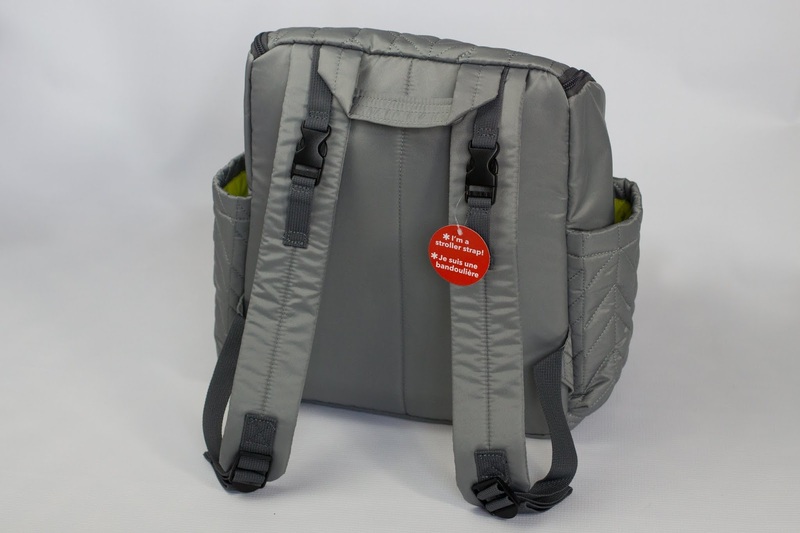 The backpack has two adjustable padded shoulder straps so you can comfortably wear it on your shoulders. The position of the straps mean you can also wear it on one shoulder if you want. 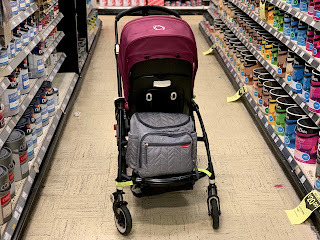 It has a large carry handle at the top so you can pick it up easily and hang it up and stroller strap clips at the top of the shoulder straps to attach it to a pushchair. The changing bag measures 40.6 x 20.3 x 35.6 cm which is probably a medium size for a changing bag. 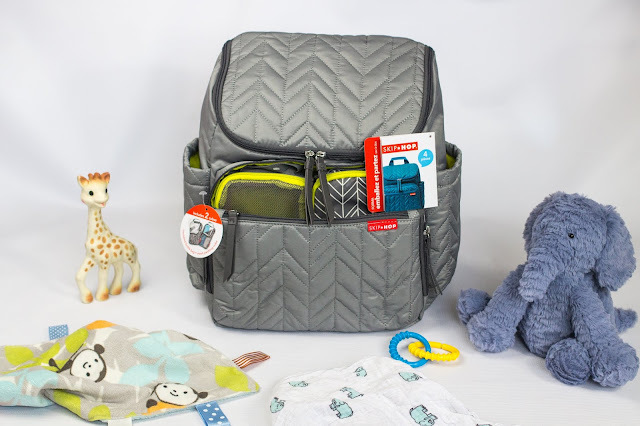 It might not be big enough if you have lots of little people, but it’s perfect for one baby and your essentials. The polyester bag is lightweight and only weighs 630g which is great for it's size. The bag has a large main compartment with 3 internal pockets to keep things organised, 2 of them are small with elasticated tops and can hold nappies and wipes easily and a larger pocket behind stores the padded changing mat, but it will also hold a tablet or laptop up to 15 inches (the back of the backpack is padded which adds comfort and also protects a laptop if you choose to carry one) . 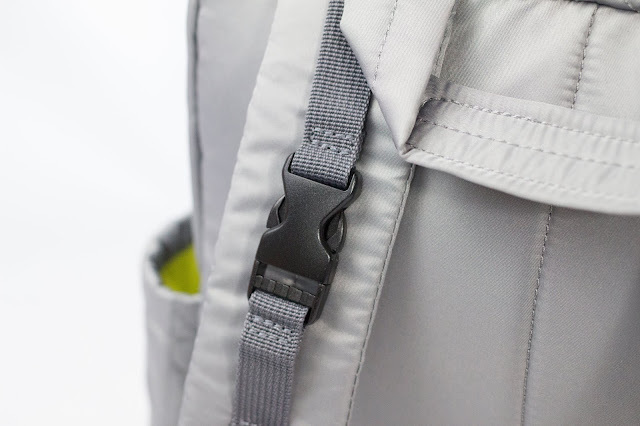 The zip opens all around the top so you can easily see what you are looking for without anything falling out. 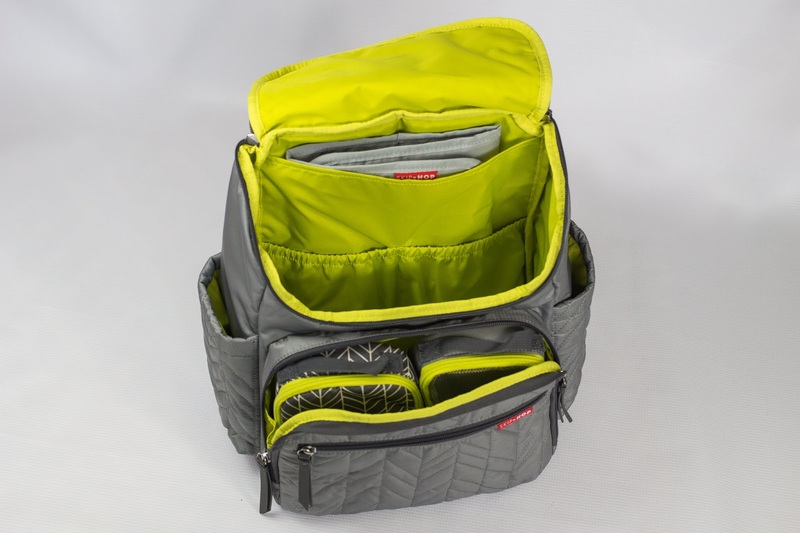 There is a second, smaller, compartment at the front which comes with 2 pouches. On the very front there is a zipped pocket which is a perfect size for holding your keys, wallet and a bit of makeup. 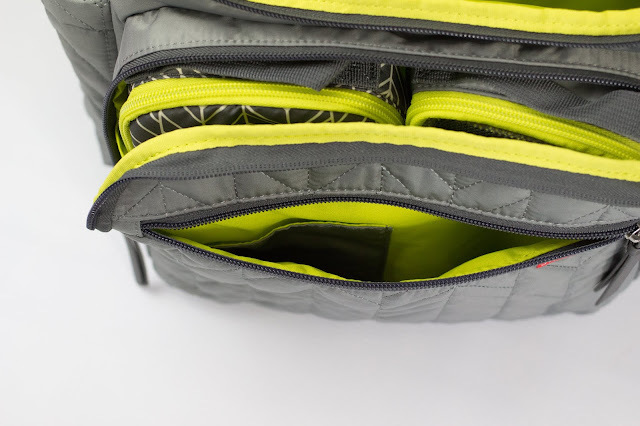 On each side of the bag there are deep, round insulated pockets where you could keep a bottle or drink. The bag recommends spot cleaning or hand washing in cold water and then drying flat. When my bag starts to get a bit grubby and older I think I will risk a gentle wash in the washing machine, but without a spin dry and I suspect it will come out ok (please note this is against the brands recommendation and if you try it it’s at your own risk). I’ll try and remember to update this post in 6 months or so to let you know what happens. The grey material is dark enough that it will hide a lot of marks and every day dirt so it shouldn’t need cleaning often. The bag is described as “water resistant” so it should be ok in a bit of rain, but you might want to avoid leaving it outside in a deluge. 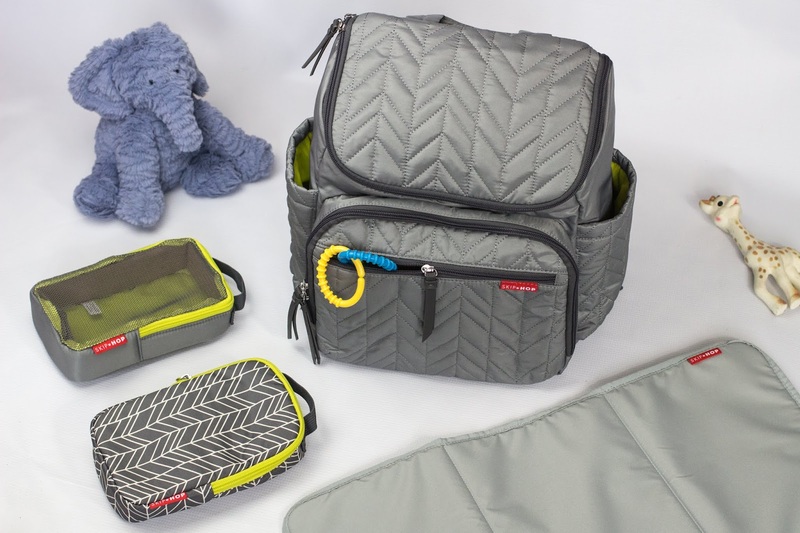 The bag comes with two pouches or storage cubes in the front compartment, one of which is insulated so it can be used for bottles or snacks, the mesh fronted cube can fit a change of clothes for baby. The insulated cube is meant to be able to fit 2 full size bottles and keep them cold for 2 to 4 hours, but I haven't tested this. There is also a padded changing mat. Stylish grey with quilted pattern and a neon chartreuse interior. It’s great for either gender and is a bag that even fussy men should be happy to carry. From my initial assessment and use of the Skip Hop Forma Backpack I think it's a great bag. I have used a Skip Hop Changing bag with my first baby and it lasted well so I look forward to see how this one does over the next few months. The RRP of the bag is £70 and as well as the new grey design it is available in Black and Peacock. You can buy the bag from Amazon (affiliate link below). I rarely manage to travel light enough to just take out a changing pod! This looks super stylish and I’m loving the inner smaller compartments too!